A large garden on the north side of Honkan adds seasonal color to the Tokyo National Museum, rich in flowers of each season. 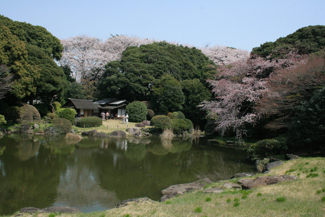 During the height of the cherry blossom season and the crimson foliage season it is open to the public. The five historic teahouses within the garden can be booked for tea ceremonies and other events, such as Haiku gatherings. The teahouse Shunsoro was originally constructed as a resting hut by Kawamura Zuigen (1618-1699), the renowned Edo-period merchant and civil engineer, during improvement works of the Settsu Yodogawa River. First relocated to Osaka, then further on to the Sankeien Garden in Yokohama by Hara Tomitaro (Sankei, 1863-1939) himself, a famous silk merchant. 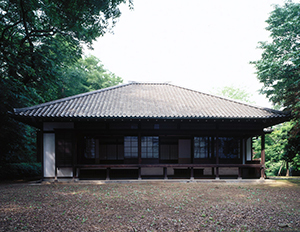 The industrialist Matsunaga Yasuzaemon (Jian, 1875-1971) moved the structure once again in 1937 into the premises of his Yanase Villa in Saitama. 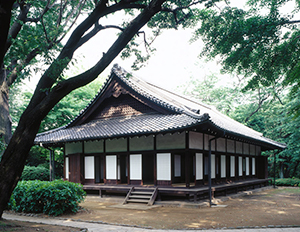 In 1948, Matsunaga donated the entire Yanase Villa to the Tokyo National Museum and in 1959, Shunsoro finally settled in the current location. Its wooden nameplate of Shunsoro, hanging on the gable, was based on the script by the well-known master calligrapher Manshuin Ryosho-Shinno (1622-1693) and was a gift from Hara to Matsunaga. The teahouse Tengoan was originally built in Rokujizo in Fushimi, Kyoto by the famous tea master Kobori Enshu (1579-1647), who built the teahouse to show people a tea caddy named "Odaimyo", gifted to him by the imperial Hachijo no Miya family. After being passed down to Jakkoji temple in Kyoto, the structure of Tengoan was then inherited by Watanabe Kiyoshi (a baron, governor of Fukuoka prefecture and mayor of Fukushima prefecture), who proceeded to relocate the teahouse to Kasumicho in Asabu, Tokyo in 1878. The ownership of Tengoan was subsequently passed on to Mihara Shigeyoshi, a director at the NYK shipping company and a collector of ukiyo-e. Mihara also came into the possession of "Odaimyo", so the tea caddy was reunited once again with Tengoan. After passing into the hands of Shiobara Matasaku, the founder of pharmaceutical company Sankyo (now Daiichi Sankyo), Tengoan and "Odaimyo" were both then donated to the Tokyo National Museum by Shiobara's wife Mrs. Shiobara Chiyo in 1963. It was built during the Keian era (mid-17th century) within the premises of Jigen'in of the Kofukuji temple in Nara according to a style preferred by Kanamori Sowa (1584-1656). 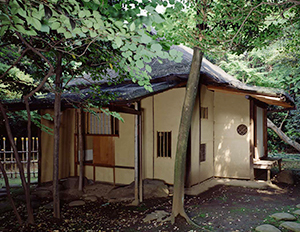 Rokusoan was known as one of the three most representative teahouses in Yamato area, another one being the Hassoan (located in the Nara National Museum compound). 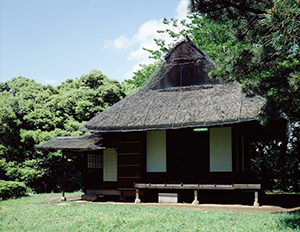 The Tokyo National Museum acquired the teahouse in 1875, but during its transportation the ship sank near Izu Peninsula. Fortunately the wooden material was recovered and in 1877 it was reconstructed at the Museum. During the World War II it was once again evacuated from Tokyo and in September 1947 finally reconstructed at the current location by Kimura Seibei, a great master carpenter of sukiya-style architecture. Other facilities like the preparation room, the waiting shelter as well as the outdoor seats were designed by Kohitsu Ryochu and added to the building in 1881. 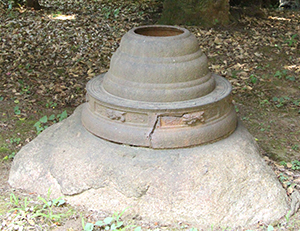 The shihobutsu-suiban-type washing basin (made from stones pagoda bodies, with four images of Buddha representing each of the four directions) at the entrance was originally a part of the pagoda of the Hosshoji in Yamashiro, built by the chief advisor to the Emperor, Fujiwara Tadahira in 925. This basin was once transferred to Ginkakuji, and after passing through various hands it then became part of the Museum collection in 1885. It was built in 1742 as a shoin (study/drawing room) at the Myogen'in temple of the Tendai school of Buddhism in the country of Owari (present day Oharucho, Aichi prefecture). 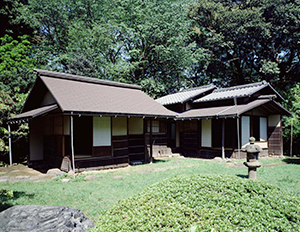 After being relocated to the villa of Masuda Takashi (Donno, 1848-1938) in Shinagawa, Tokyo, it was donated to the Tokyo National Museum in 1933 to be moved to the current location. The ink paintings on the interior walls and sliding doors (the current installations are high-resolution digital reproductions) by Maruyama Okyo (1733-1795) are supposedly executed in 1784, when the painter resided at the Myogen'in under eye treatment. The tokoharitsuke paper panels depict old pine trees, stones and bamboo, whilst on the Koshishoji panels are young pine trees as well as stones and bamboo. Originally located in the residence of the Kujo Family within the imperial palace compound in Kyoto, it was relocated to the Kujo Villa in Akasaka, Tokyo, where the family head of the clan used to dwell. The Kujo family donated it to the Museum in 1934, and it was moved to the current location. The interior walls decked with painted paper panels tokoharitsuke and the fusuma sliding doors are adorned with paintings of landscape with pavilion by the Kano school. The transom made of a single Chinese quince wood piece display fine openwork of Japanese Wisteria lozenges. 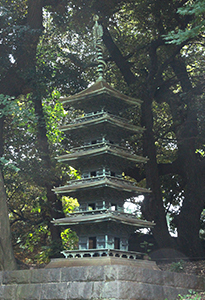 The bronze pagoda is 570 cm tall. Its details such as the winding dragon on its peak, the taruki rafters, and the tokyo bracket complex are elaborately executed. The carved inscription on the podium recites the dedication accompanying the donation by the fifth Tokugawa shogun Tsunayoshi (1646-1709) to the Horyuji temple: "Horyuji temple in the country of Yamato, the first year of Genroku (1688) on a day of the 12th month, from the Shogun Joken'in Tokugawa Tsunayoshi." Yet there usually is no practice of stating the posthumous title (Joken'in) in combination with the secular title to a dedication during the lifetime of a person (Tsunayoshi died in 1709). In this case his posthumous title along with the date of the dedication was presumably added after his death. The first three National Industrial Exhibitions, which the Meiji government organized as part of its industrial policy, took place in Ueno Park. The Japanese first ever museum in naming and in reality, of red brick and located just north of the current Honkan building, was constructed for the First National Industrial Exhibition in 1877. The former Honkan designed by Josiah Conder (British architect, 1852-1920), which was used for the Second National Industrial Exhibition, was built in front of it in 1882. The First Exhibition witnessed more than 450,000 visitors during its 102 days of opening, the Second 820,000 visitors during 122 days. These exhibitions not only greatly improved the industrial capacity of the nation, but the multitude of art objects exhibited also developed a more general appreciation of the arts. Special budged plans were designed for the Museum to purchase the objects exhibited, which still marks an important part of its applied arts objects collection of the Meiji period. This memorial for the Second Exhibition is the only one in existence. 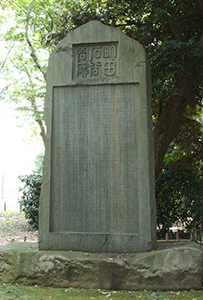 This is a memorial stele for the founding director of the Museum, Machida Hisanari (1838-1897), who was born in Satsuma (present-day Kagoshima prefecture). He moved to Edo (present-day Tokyo) to study when he was 19. When he traveled to Britain in 1865, visiting the British Museum amongst other places, he was inspired to establish museums in Japan. This aim he realized once he returned and began to build the foundation of museum in Japan as the first director of Hakubutsu-kyoku (department of museums), subordinate to the ministry of culture of the Meiji Government. He also pledged for a thorough analytical examination and protection of cultural properties, devoting his own wealth to the collection of old Japanese arts, thus saving them from dispersing out of the country. After his retirement in 1882 he became a monk and died on the 15th of September 1887. 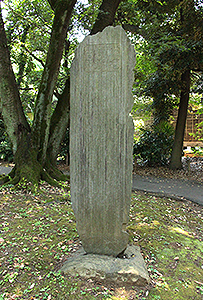 His grave is at Shinryoin temple of Kan'eiji. The current Tokyo National Museum including its large garden is located on the former compound of Kan'eiji temple and its graveyard. 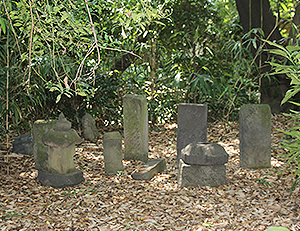 There is not much left to trace this history, but the gravestones of the clan of Arima, feudal rulers of Maruoka in the country of Echizen, are one of them. A thorough clearing process of the former graveyard to convert the space into a garden is recorded in the years from 1882 to 1886. Why these gravestones alone have been left untouched in the garden is not clear. This porcelain toro lantern is the work of the famous Kyoto potter Kiyomizu Rokubei IV (1848-1920). 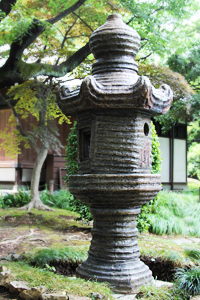 It was donated to the Museum in 1938 by his successor, Rokubei V.
An iron lantern used to be set on this stone base. Its fire alcove is executed as openwork of lozenges whilst the pillar is cast with an unryu-pattern (clouds and dragons). But due to the decay caused by rust, the lantern was broken just above the pillar in the typhoon of January 1982, and the broken parts are now stored separately. Currently only the stone foundation is still in situ. Although there is no inscription, the work may be ascribed to Nagoshi Kenpuku (died 1819). He was the sixth generation foundry artist of the Edo Nagoshi family, famous for their tea ceremony kettles (chanoyu-gama).